We went to the Bethlehem Pennsylvania Musikfest 2010 and in addition to the Banana Factory Mobile Glassblowing Studio and glassblowing by Beth Ann Ballek making a Moustache Cup and Zander Dog Sculpture, there were many other artists and craftspeople selling a wide variety of items. 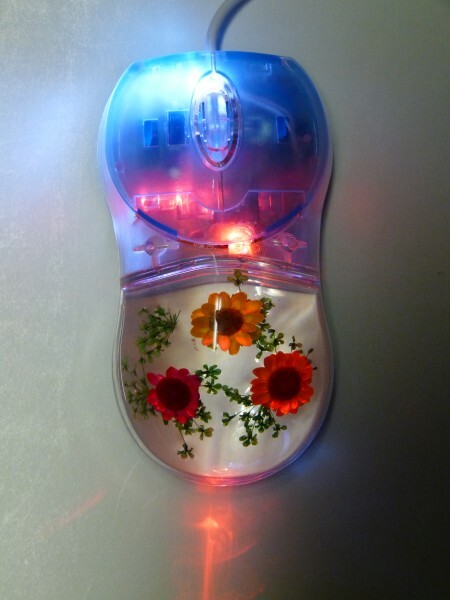 We found particularly unique and beautiful the computer mice by A&B Butterflies whose website is at http://www.abbutterflies.org/. The “A&B” is an acronym for “Amazing & Beautiful” which is cerainly true of butterflies and their life cycle! While, as their name implies, A&B Butterflies, owned by Katja Palmer and John Loveland, focuses on a wonderful variety of butterfly and insect items, their dyed strawflower computer mice were particularly beautfiul. Often when we think of incorporating art into our computer environment, the limits are a fancy mouse pad, screen saver, or desktop background graphic. 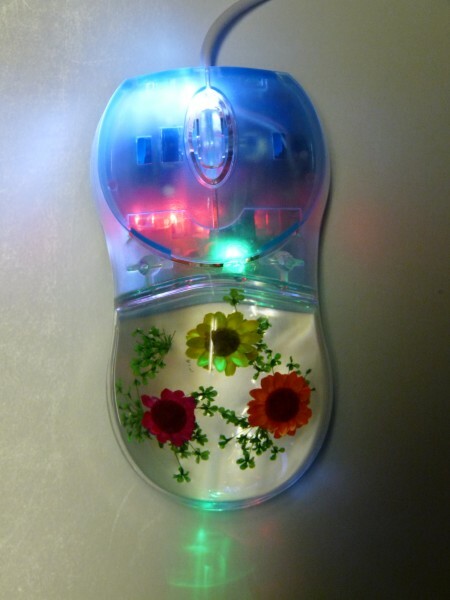 But with these dyed strawflower computer mice, it is art that you would use and touch every day. If you prefer a wireless mouse, they are working on getting wireless mice soon too. The lights (tri-color LED) change color — red – green – blue — as you can see by comparing the photos above and below. This entry was posted in Computer Miscellaneous. Bookmark the permalink.